With about two hours of sleep I packed up my bags and caught a 530AM flight to Kochi in to meet Suze and Ana. 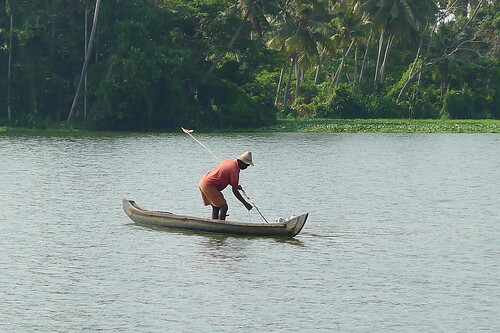 Kochi is in south India in the beautiful state of Kerala, two and a half hours by plane from Mumbai. I landed around 8AM but by the time I picked up my luggage, found a taxi and arrived at Suze and Ana’s home stay in Fort Cochin it was past 930AM and they had left for breakfast. Their home stay owner, Kumar, gave me a ride on the back of his scooter to the café they were eating. I was smiling big time on the back of his scooter with the wind in my hair and sun on my skin passing by the small streets of Fort Cochin, lined with coconut and palm trees. I was very happy and relieved to see Suze and Ana at the café after my early and long journey from Mumbai. They were excited to see me and recounted their last few days in Kerala trekking through the tea plantations of Munar and exploring Fort Cochin. After breakfast we picked up our bags from the home stay and got a ride to our houseboat in Allepey with Sajesh, a local private cab driver who kept us very entertained on the two hour drive from Fort Cochin to Allepey. In my research for planning my trip, renting a houseboat was at the top of my list and I was so thrilled to learn Suzy and Ana were going to be in India at the same time and wanted to rent a houseboat too. Here was our home for two lovely days. We spent the first afternoon in awe of the stunning landscape of the Kerala backwaters and watching other boats go by and scenes of daily life, like washing pots, doing laundry and bathing in the rivers. At lunchtime we docked near a rice paddy and had local fish, rice, spicy green beans and cabbage salad. Lunch was very flavorful and delicious, followed up by fresh pineapple for dessert and a much needed post lunch nap. On our way from Fort Cochin to Allepey Sajesh, invited us to a family party for one of his cousins getting married. He was very kind to invite us and pick us up from the houseboat in the evening to go to the family gathering. Just as we docked our houseboat back in Allepey the sky opened up and it started raining buckets, so by the time we got to the party it was a full on storm with wind, rain, lightning and thunder. The party was in full swing with a huge outdoor kitchen in the back and groups of Sajesh’s aunties, uncles and cousins scattered throughout the house. They did not let the rain spoil the festivities and cooked in the rain and wind. We had an amazing home cooked meal of dosa, rice and curried veg by flashlight as the storm kept causing the power to go in and out. Sajesh’s younger cousins were very keen to practice their English with us and it was cool to see the family resemblance amongst them. They had the same beautiful eyes and smiles. The storm eventually petered out and Sajesh drove us back to our houseboat where we immediately crashed listening to the sounds of the Kerala backwaters. We woke up to the smells of breakfast being cooked and hot morning sun at 8AM. We ate our omelets, fruit and toast looking out on the river and boats passing by. 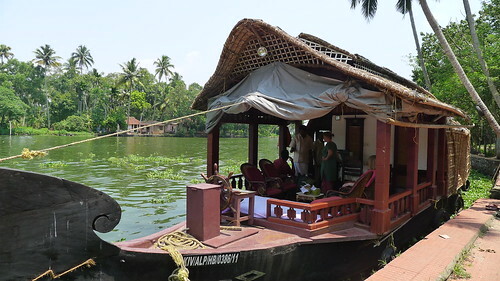 We cruised around the backwaters more stopping a a corner shop for cold drinks, snacks and fresh river prawns for dinner. Most of the morning was spent navigating narrow canals reading, listening to music and catching up with Suze on life back in London and dreaming of other places to travel to. We escaped the heat of the midday sun with a nap and woke up for lunch near another rice paddy. Dinner on the houseboat was again amazing. The prawns we bought at the riverside corner shop were grilled with spices and turned out very aromatic and flavorful. Perhaps it was the hot sun or our full bellies or a combination of both, but we turned in early after dinner to read and cool down with the AC in our rooms. At some point in the night I heard a rustling scratchy sound coming from the corner of our room by our bed’s headboard. It was so loud I clear I thought something might be in our room. I woke Suze up and whispered “Do you hear that? I don’t think were alone in here”. She listened for a moment too in the dark and heard the same loud rustling in the corner. Armed with my flashlight Suze investigated the mysterious sound. We didn’t see anything in the corner besides my suitcase so determined the noise was coming from outside the boat on our deck so we were safe and sound. The sound continued and the fear we had before turned into annoyance at the loud noise in the corner because it was keeping us up. We pounded on the wall and flashed the light out our window to scare off whatever creature was using our boat as a scratching post. We mentioned the noise to Sajesh the next day and he thought it was a river rat or a mongoose. If it was a rat, it had to be very large to make all the noise we were hearing. Eew and Eek!